Oh, life! It’s really too much sometimes, isn’t it? Some days it seems like the whole world is against you, and you can’t even remember the last time that it wasn’t. Whether it’s a fender-bender in the parking lot, a rude neighbor, or a co-worker offering the kind of gossip that makes people feel just a little bit uncomfortable, sometimes all the negativity becomes overwhelming, and the only thing that makes any kind of sense is just to get away from it all. The part of Eastern Tennessee near Great Smoky Mountains National Park has been a quick getaway destination for generations, thanks to its blend of incomparable natural beauty and access to cities full of people who know how to make visitors feel welcome and show them a good time. Gatlinburg, Tennessee, is located right in the heart of all the action, and if you decide to poke your head out from hibernation from one of the lovely Gatlinburg chalets available for rent, there’s plenty to see and do. Whether it’s just on the drive to the Smoky Mountains or during a day spent outdoors, the Great Smoky Mountains National Park is a sight to behold. Visitors can take go hiking, biking, and fishing throughout the park, which boasts both unspoiled landscapes and historic buildings that showcase the pioneer history of the region. If a real break for you still requires a certain amount of hustle and bustle – just not exactly the same as you get at home – the downtown Gatlinburg strip certainly delivers, with its blend of attractions like roller coasters and fun museums, great shopping for local and regional favorites, and enough restaurants to keep you dining out for weeks, if you wanted to. After a day like that, what could be cozier than a night in one of the area’s famous Gatlinburg chalets? Mountain chalets in Gatlinburg are famous for the way they combine rustic charm with modern luxury. At the Life’s a Bear Retreat you’ll find yourself in a 3 BR/3 BA chalet that sleeps ten and comes with seriously cool amenities. You’ll be able to enjoy a great Smoky Mountain view from your on-deck hot tub, and you and your traveling companions will appreciate the cabin’s other features, like the large game room with a pool table, a fully-equipped kitchen, an electric fireplace, cable TV and WiFi throughout, a stereo system, and summer access to the tennis court and swimming pool at nearby Chalet Village. Gatlinburg chalets like this don’t just make hibernation a possibility, they make it downright dreamy. Don’t Wait Until Things are “Unbearable” – Book Today! 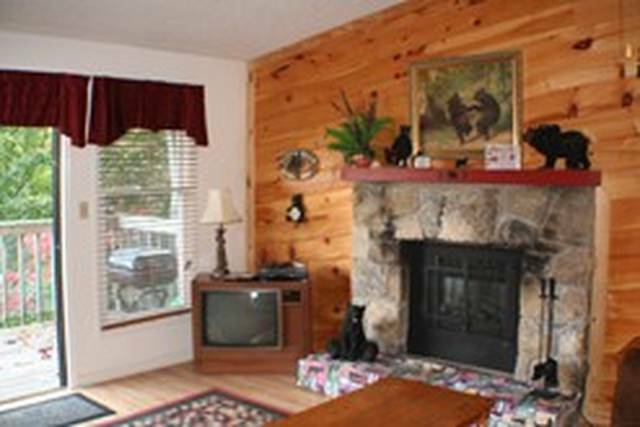 Chalets in Gatlinburg are popular with vacationers and fill up quickly during the times of year when people are most ready for a break. Let the team at Ski Mountain Chalets help you book the Life’s A Bear Retreat, or any of their other cabins perfect for getting away from it all!